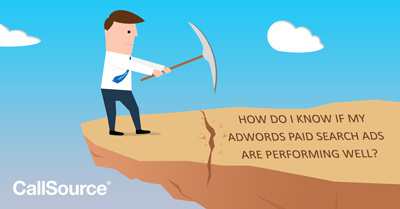 Are my AdWords Paid Search Ads Performing Well? 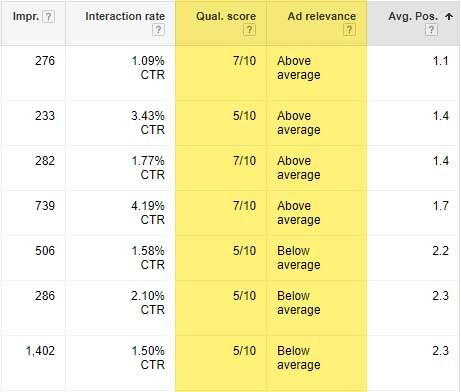 How to know if your Google AdWords paid search ads are performing well and what to do about campaigns that are underperforming. What are the right goals for each particular campaign? How and where is success measured? Before jumping in, I’m going to assume you know enough to be dangerous in AdWords and have the fundamentals down. If you want to learn the fundamentals or want a refresher course on Google AdWords or Paid Search, then I recommend you first jump over to Lynda.com and take the Essentials Course. Why didn’t I recommend you take the Google AdWords Certification Course + Test? Simply put – I am not a fan. I do not think it provides the strategic mindset that is most beneficial for marketers who run AdWords accounts. For that, I recommend taking the Lynda course mentioned above or a course that gives you strategies and proper expectations for running campaigns. You cannot know if your AdWords campaigns are successful unless you have given them appropriate time and you have set them up for future optimization (that you plan to do). I agree with Brad Batesole, the author of the Lynda course, when he says, “A typical AdWords campaign will hit its stride in about three months.” It can be painful to look at your dashboard every day for hours on end and stare at that 0 conversion number. You need a better hobby…. Let’s start with the crucial elements you have to get right for any Adword campaign to be successful. Ad Position – where on the Google search page your advertisements will appear, in a numbered and ordered list, where position 1 is the most desirable and 10+ is the least desirable position for your ad. Relevance – (aka Ad Score) a mixture of the quality score based on the congruence of keywords being matched, advertisement copy being served, the landing page performance metrics, and the history of success. Auction-Based Bidding – bidding on keywords based on the demand for each keyword at any given time, in order to be the highest bidder and win your position on the search page, so your ad is served to the searcher. Start with the goal in mind by ensuring you design your campaigns for a single specific outcome. First, can you go down your list of campaigns and tell me what the goal is? Yes—one singular, overarching goal. Ad Groups should be distinctly aligned to this same goal, too. Brad also suggests that you theme your campaigns – I am a fan of this, as I even distinctly theme my own ad groups to the goal and match types I am utilizing. Now, here’s a great question to ask every time you are scoping out a new campaign. Or, you can even apply it to existing campaigns to see if they follow this rule. Who is the best audience for this goal? First, we may need to define what am I talking about when I say audience. Building your customer avatar or persona that aligns with your intended goal. The best way I have ever seen a customer avatar built is from a worksheet provided by Digital Marketer. Head over there and grab their sheet because it is an amazing foundation for getting started on persona work. Once you have your avatar built, make sure you have checked off each of steps we’ve outlined so far. It is a best practice to go step by step through your AdWords account to make sure you are not committing egregious errors and are allowing your campaigns to be successful. By eliminating your errors, you can turn your focus to more creative prospects for your account. What motivates your ideal customers? Be specific. Why should your ideal customers care about your products/services? Be specific. What is the specific pain that you want to solve for? Be specific. At the heart of knowing if your AdWords ads are working is this fundamental truth of marketing – the best marketing is specific and personalized. Nine out of ten errors in AdWords campaigns are committed by being not specific enough or aligned well with your ideal customer. You have to learn your customers’ pains, their identities, and ultimately how they search online (what keywords or slang they use). What does this kind of specific look like? Well, imagine that you said my ideal customer is 30 to 45 years old, usually a female, and works full-time. That’s broad – you can do better. So let’s enhance that. Now you say well… actually, our best customers are usually 40 to 45-year-old females who are married to white-collar partners. Both work full-time, and they need to live within 45 minutes of my stores. That’s better, but you can still get more specific! I’ve already touched on how it’s an acceptable norm to give your AdWords campaigns at least three months (90 days) to adjust. If you skimp on this, you will likely always see poor results and give up completely on trying to get sustainable wins in AdWords. But I want to get more detailed now that we have the basics out of the way. The crux of the problem isn’t that you need to be the best AdWords marketer ever. Instead, it is simply to find out if your ads are working well. “Well” in this context means that you’ve got your kinks and errors worked out and now you are just trying to refine. Am I familiar enough with the AdWords interface to know where to go to find my KPI metrics that I have planned for my goals? Do I have a report with my KPI metrics along with the corresponding campaigns/ad groups/ads and keywords for the desired specific goals? What are my quality scores for my ads? Do my ads need better relevance? Have I set up and optimized my landing pages for the advertisements? Have I set up and tested my conversion tracking to ensure that I am receiving conversions into my AdWords account? To get more familiar with the platform such as where everything is located, where to go to answer your question, etc., you simply have to spend time in there. Google has a plethora of guides and searchable help to lead you where you need to go. AdWords has the capability of solving more questions. If you are still stumped, there is also the reliable online search to perform. AdWords has a new(ish) reporting feature built right in that you can use to search for and build reports based on your own campaigns. I caution you that it does take some getting used to, so start playing around with your reports. Look online for examples of reports others have made for good examples. Try not to overdo your reports – stick with your KPIs. Quality scores are attached to keywords, but they also correspond to your ad copy and the destination landing page. Quality score is Google’s measure of how relevant the experience of the user is to the ad. The higher the score, the less you pay. This is set up this way because Google wants to give users the best advertisement experience they can. The more people spend on ads, the more money they make – and they will only do so if it’s a good environment to do. Try to make the experience of the person clicking on your ad seamless from start to finish. You want the colors and the wording to be as similar as possible. Manage their expectations. If you tell them they will be learning more, then teach them! Do not ram a lead magnet down their throat. If you say, “see the difference?” then show them the difference. It’s shocking how much these tenets are violated. You also need to make sure the page loads quickly, does not have damaging pop-ups and that the copy of the page aligns with your keywords and your ad copy. There is a lot that can go into landing page optimization, but I will save that for another article. You have two places you need to go to ensure that you have setup your conversion tracking. First, your tracking code (tag manager) needs to deploy the tracking event. Second, your AdWords account should have a conversion setup. Go to the conversion menu inside AdWords and make sure this is set up with a value. To finish, test it and make sure it fires and all the data is recorded accurately. Your AdWords will be lightyears more accurate if you are tracking your conversions into AdWords. Now what, I’ve done everything! If you can check off each list, I’ve delivered and are still having issues of knowing whether or not your ads are working well, then consider these big-picture metrics. Aim for the best but always try to make fine adjustments over months of time (things won’t work better overnight most of the time unless you goofed). Remember, what truly matters is making your goal happen. A click-through rate above 2%? Keyword quality scores at or above 7? Notice I didn’t say anything about the cost per click, conversion rate, view-through conversion rates, match types, search terms, or ad extensions. This is because this is very subjective to your individual campaign. A guide that delves into these has to consider that if you are using them, it aligns with your goal. Congruence with your goal is key. I would recommend evaluating your search terms report and taking advantage of your ad extensions… but how you go about maximizing this depends on your campaign goal. You need always to be striving to find new customers. But showing the right relevant message and keeping your campaigns specific takes patience; optimization takes time. Learning to be patient is the only pain I cannot give any advice on. It’s not easy. Thanks, I hope that now you can say, “Now I know I need to define what well means for my campaigns before I can see if they are performing,” and “I know how to find out what success is for my AdWords account.” If you have questions, comments, or ideas, feel free to add them to the community to see in the comments section below. Does Your Business Have Text-Enabled Phone Numbers? It Should.